The question I pose here is one which I imagine causes confusion in most parts of the world, even in the UK! Question – My passport states that I am British, but what does that actually mean? Whenever I go on holiday overseas if someone asks me where I’m from I would reply England as I consider myself as English. 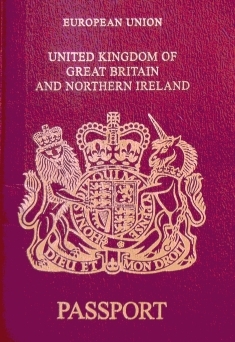 However printed on the front of my passport is United Kingdom of Great Britain & Northern Ireland, but inside my nationality is given as British. How confusing. No more so than if you are from outside the UK. In France they have the Republic of France printed on the front of their passport and their nationality as French – Easy! On a recent holiday to the USA when asked where do I come from after responding England I was asked “well what language do you speak”. So there is some confusion, people often confuse England as being Britain, Great Britain or the UK. So let me try and qualify what is being British. Firstly the word British is an adjective, it pertains to the United Kingdom; for example, a citizen of the UK is called a British citizen. England’s dominance and power in Great Britain and the UK stretches back many centuries. As the largest part of the UK, England has roughly 85% of the population of the entire UK. Geographically England covers about 55% of Great Britain. London is England’s capital and the largest city in the UK, it has been centre of government for the United Kingdom since 1707. Scotland was a separate country from England until 1603, when King James VI of Scotland inherited the English throne. England and Scotland remained separate until the Acts of Union were passed in 1707 thus merging the English and Scottish parliaments into a single United Kingdom parliament. By 1707 England already controlled Wales and Ireland (that is the whole of the island of Ireland). Wales has a complex history with England which has spanned many centuries, it has been officially considered separate from England since 1955 when Cardiff was officially recognised as its capital city. In 1999 both Scotland and Wales were granted some self governing powers, the Scottish Parliament and the National Assembly of Wales now has some ruling powers. Northern Ireland was established in 1921 following the partion of Ireland, this was as a consequence of the Irish civil war. It is the only of the four UK countries that is located on a different island. The Republic of Ireland (ROI) came into being in 1949 after an act of the Irish parliament which proclaimed Ireland a republic by discarding the remaining duties of the monarch. 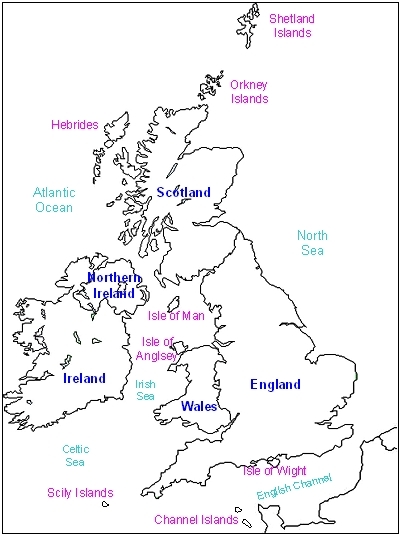 Now – to add further confusion we have the British Isles – these are in fact a large group of islands. 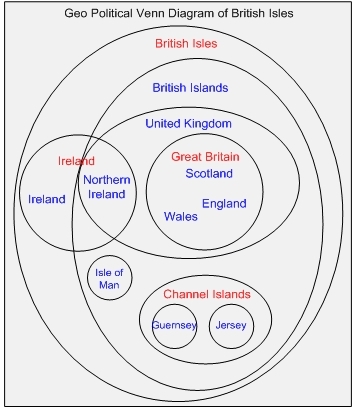 The two major islands in this group are Great Britain (consisting of England, Scotland and Wales) which is the largest, and Ireland (consisting of Northern Ireland and the Republic of Ireland) the second largest. The British Isles consists of more than 1,000 islands, of which 51 have an area larger than 20 km². The Channel Islands, The Isle of Wight, the Hebrides, and the Isle of Man are some of the more well-known small islands in the British Isles. 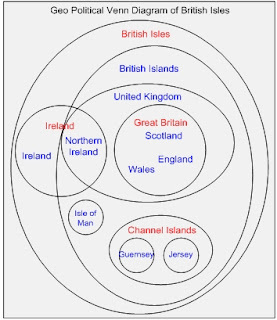 Various terms are used to describe the different and overlapping geographical and political areas of the islands of Great Britain, Ireland, and surrounding islands. The terminology is often a source of confusion, partly owing to the similarity between some of the actual words used, but also because they are often used loosely. I hope you found this short history useful and that this post goes some way towards explaining what is British, and what is not! This entry was posted in British by Tony. Bookmark the permalink. "Something you might want to add to today's posting is that in the 19th century the term England was often used when Britain was meant – indeed, even today we are likely to talk about the Queen of England." I enjoyed your post! I visited the UK a few years ago and was struck by the differences between England, Scotland, and Wales. The majority of my ancestry is English, so I hope to get back some day now that I know a bit more about my family. Welcome to genea-blogging – may you write everything you think we need to know! Hooray! Someone else who knows the difference between England and Britain, and why it matters. I'm doing my best to spread the word too, and it's good to know I'm not alone. Good to have you here – nice blog, too. Welcome to the Geneablogging community. I've added you to my reader. I've awarded you the One Lovely Blog award.